Finally got my connection activated and am using it right now to write this. I must say Murphy's law works flawlessly. "When something can go wrong, it will". I just did my very first speed test on this connection. 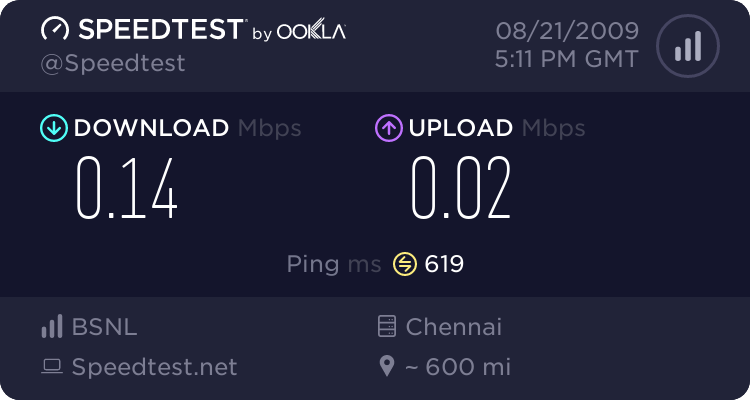 As expected the ping time was extremely high, but the worse part is that the speed test.net site itself took about five minutes to load. LOL! Considering that 0.14Mbps =144kbps. I think my card is in the CDMA mode and not the EV-DO mode. Will go through the threads on India Broadband Forum and try to figure out a solution. Too tired to look through it. Will update again tomorrow morning. Watch this space. What happened with your EVDO connection? I am from Surat and I was thinking of buying the EVDO from BSNL. If you could answer these few questions for me it'll be of great help. 4. Is it UNLIMITED or Fair Usage is applicable? 5. Should I buy this or think of something else. I am thinking of gifting it to my Dad. He is currently using Hathway internet through Cable connection and facing lot of downtime and slow speeds. I'm still using it. I don't know if it is available in Surat. It is available in a small town like vellore in Tamil Nadu so I suppose it must be available in Surat as well. Speeds are OK. I get consistent 50KBps that is 50x8=400Kbps. Not the full speed of 2.1Mbps but it is still OK. The point that you need to take care of is whether you get the signal at the place you want to use it. For e.g. I get very mild signal at my office where I want to use it. It is similar to dial-up at my office which is bad. At home I get the above mentioned speeds. It is a good gift if you get 3G signal at your place. No need to think of anything else as all the others are limited and have FUP which is crap. As for Windows 7 compatibility. Windows 7 automatically installed the drivers. I didn't even need to use the supplied software. Just create a new dial-up connection in the network and sharing centre and it works out-of-the-box. I've still installed the software to monitor the signal levels. It shows the bars like in a cell phone. Hey thanks a lot for the info..I guess I am gonna let the BSNL guys come over to my place to check the signal strength and download speed tests. Btw I was in Bangalore for 3 years studied there nice to know you from Bangalore as well.. I didn't say Surat is a small place. I said it is available in a small town like vellore so it must be available in Surat but just check, but anyways. Nice knowing that you too have stayed in Bangalore. Or take a chance like I did and try it out for the mandatory first 3 months and if not satisfied, return it after that.